The living room has been my biggest project since we started properly decorating. I've always got one or two projects ongoing and it's never quite 'finished' - remember that living room tour I keep saying I'll post? It's constantly on stand-by as I've always got 'one more thing to do' before it's officially finished. I will post it soon though. In the mean time, I wanted to share a mini project I've finished recently. A few of you were asking about it on instagram so I'd chat about in on here too. I've wanted a hanging light feature ever since I noticed a few on Pinterest. I just thought the bare bulb and loose wire looked really different and I loved how creative some people were with how they'd hang them. Some of the lights were wrapped around shelf brackets, wall hooks or even bed frames. This corner of my living room needed light, but it's also the corner where all our cables and tv boxes were stored so there wasn't any floor space for a standing lamp, so it was the perfect place for it. The wall hooks were a nightmare to find. 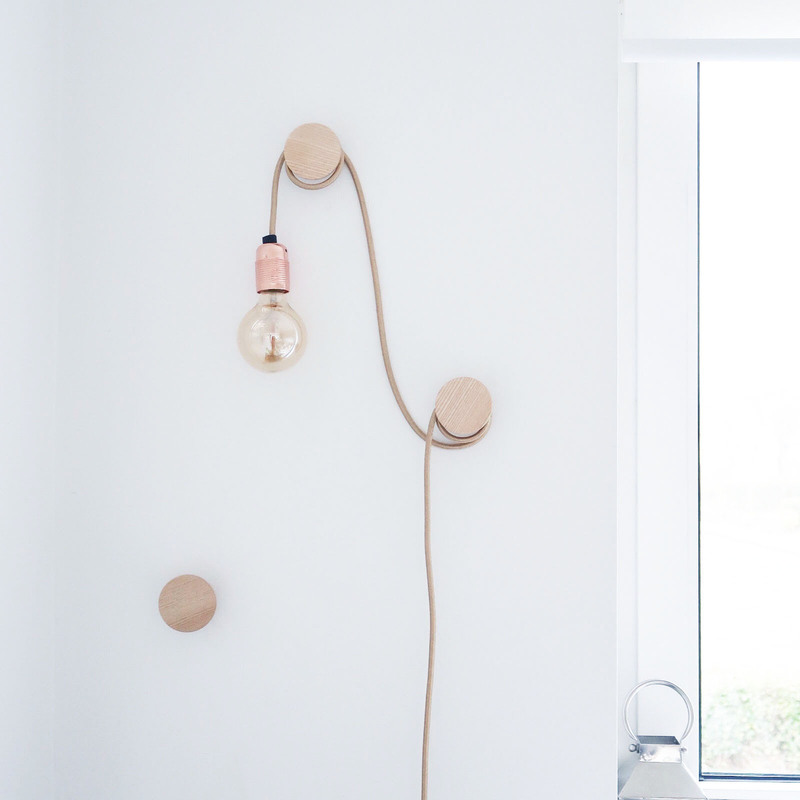 Some places were charging £16 per wall hook and I refused to pay almost £50 for three bits of wood. Then by total chance, I found these wooden wall hooks reduced to £7.50 for 3. The rubber edging peeled off and I was so happy that I'd gotten exactly what I was looking for for such a good price. They're back up to full price at £15.00 but it's still excellent value compared to others on the market! I have a lot of copper accents in the room so went for this copper pendant light from Amazon. It took about 3 weeks to arrive and I'm pretty sure it came from China, so be prepared to wait if you order it. It was super easy to put up thanks to Andy's friend drilling the holes in the wall (we're both useless like that), and then it was just a case of wrapping it round and plugging it in - easy! I absolutely love how this turned out, and I'm really glad I waited to find exactly what I wanted for a fair price. If you're thinking of doing something similar, I think it's best to chose somewhere that you have a piece of furniture underneath as it can look messy if you can see the wire touching the ground. We put in a small table unit to hide the wire at the bottom. Also, make sure it's near to a plug point as the wire needs to hang loosely for full effect, and that's lost if you need to pull it tight to plug it in. Check out my Pinterest board on hanging pendant lights to see some other ideas I loved. What do you think of this light feature? 7 comments on "Hanging Bulb Feature Light "
This is the cutest way to hang a light! You've given me some serious home inspo now! Wow, such an easy thing to put together and yet really effective. It looks lovely. This looks so cool. What a bargain too.. I may just have to try it out!